The 100DayProject Challenge is a great idea, started up by the online magazine The Great Discontent. This concept challenges readers to commit to 100 of days learning something new, or focusing on a creative project, or making a lifestyle change. The 'Challengees' post on Instagram their daily progress using the proverbial hashtag #100DayProject. At the end of the 100 days the online site selects to highlight the successful outcome of some of the participants. In 2017 I committed to this challenge but within two weeks I was overwhelmed and quit. I was so disappointed in myself as I'd selected a fairly easy project to commit to. When I quit, I imagined all the successful artist participants as being more organized and perfectly pulled together than I; they working from gorgeous studios and selling all they created during their challenge run and enjoying press for their efforts. Admittedly, I'm the kind of artist who falls in love with ideas before thinking the whole thing through enough to realize that 100 days is a whole lotta time to marry oneself to, using up daily hours for a daily progress report. Furthermore, as an illustrator and gag writer and one who manages an attention deficit issue; I found it hard to wedge in another task that could absorb one-two hours of my day. Remember, this not only involves creating the item, but shooting and/or scanning, cleaning up the image in Photoshop or Snapseed, posting on social media and blogging about it. This adds two more hours on top of art-production time. So I ended the challenge and started again this year, full of promise, reminding myself that the failed challenge was adding on another hand created task that interfered with my daily process of running a busy ETSY shop, plus trying to finally get another one up and selling on a regular basis. This year I cleverly decided to incorporate the task of creating art for my second ETSY shop SuzanneUrbanArt, thus integrating a daily task that matched up perfectly with a personal goal of mine. 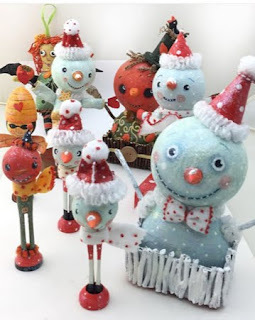 Aren't I clever thought I. and started off with a bang that resulted in several finished holiday characters plus one up for sale in a juried artist group: Ehag Artist Emporium. And it sold! But slowly I missed a day of posting on IG, then another day, my daily productivity was crashing to a halt as my work space became too cramped and disorganized to work in. Some creatifs can work amid chaos, I. Can. Not. Clutter in my physical exterior creates clutter in my ADD mind. re-orging my studio and back on the #100DayProject Challenge wagon I'd hop. Two days became two weeks that included ordering bookcases, selling old furniture on Facebook Marketplace and purging stuff, stuff accumulated when I fell in love with the idea of exploring a new medium with out thinking through how I could use this medium to create something that happily fit my personal, authentic style. What I learned about the #100DayProject is, I'm not ready for it, or it's just not for me. I'm capable of focused discipline, due to years of working in left-brained habitats and freelancing around them, but making the switch full-time to my own studio work takes more conscious mental shifting than I ever thought. One must stay inner-focused A LOT. However, this challenge exercise, though brief, opened me up to seriously organizing my studio to enhance productivity, aid my ADD issue (everything containing supplies is stashed in homogeneous groups and labeled) and most importantly, the new white furniture, and area rug reflect much needed light in a studio with one window.